And so it was with our legions of blueberries. The secret to getting a really nice deep flavor is to cook the sauce down for a good long time. That concentrates all the flavors and makes it lusciously thick like a BBQ sauce should be. I didn’t feel like cheating and using liquid smoke for the smokiness, not this time. Instead, chipotle powder giveth smoke and spice. If you haven’t been knocked over the head enough with this information, chipotle is smoked jalapeno peppers. In this case, they’ve been dried and ground up. I’m not a spicy heat fiend by any measure, but I guess I can handle my own. If you are wimpy then use only two teaspoons, or use smoked paprika, which is milder and also more readily available. If you haven’t tried chipotle powder, give it a go! I got mine from Penzy’s and I’ve been using it in a variety of dishes; roasted potatoes, chili (well, obviously), scrambled tofu, split pea soup. It’s really been pulling its weight around the kitchen. Fine, it didn’t photograph all that well. Lay off, it can’t be perfect! Preheat a sauce pan over medium heat. Saute the onions in the oil for about 10 minutes, until lightly browned. Add the garlic and ginger, saute for a minute more. Add the blueberries, veggie broth and soy sauce and bring to a boil. Once boiling, add the chipotle, molasses and sugar. Lower heat and let simmer for about 45 minutes, until it’s reduced by about half. It should be nice and thick. Adjust sugar and salt if you need to. Turn the heat off and let sit for about 15 minutes before using, stirring occasionally. I used the BBQ sauce on tofu and tempeh. For the tofu, I pressed it and dredged in 2 tablespoons peanut oil and 2 tablespoons soy sauce. Bake for about 20 minutes, then flip and coat with lots of sauce. Bake for 15 more minutes. Same for the tempeh, only I steamed that for about 10 minutes. I love the way basmati or jasmine rice taste with BBQ sauce, so make me happy and serve rice alongside. I think I’ll try this with blackberries, since I have access to at least eight billion of them. Blueberries? On the grill? I don’t know, Bobby. This recipe is a lot of fun. I didn’t think fruit and bbq could ever co-exist so harmoniously together, but it has been done. Hallelujah! This sounds great to me and I will try soon.I’m planting blueberry bushes this year so am looking forward to picking from my own yard next year. Chipotle powder is a wonder drug, it cured my husband of putting cheese on his popcorn! that is genius! i love sweet and savory together like whoa. and diddo on the chipotle thing…it is great! i will have to try this sauce with some tempeh. and cornbread. and greens. mmmmm…. Wow, that looks really good. I can’t wait to get some chipotle powder! I have a wealth of summer blueberries in the freezer just waiting to be used. I second the chipotl? powder from Penzeys. I went crazy with the stuff when I first discovered it. Now I kind of use it more like a normal person. Which is to say, I don’t put it in everything. And I like the photo. 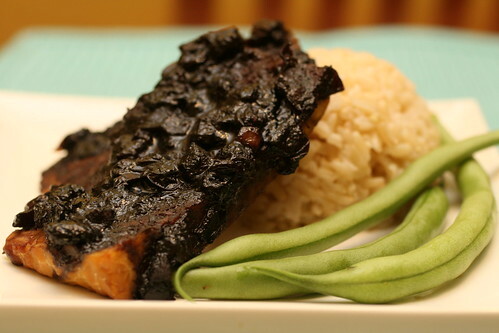 It emphasizes the barbecueness of the tempeh. But yeah, it just adds awesomeness to any affair. Blueberries?!?!? For a BBQ sauce?!?!?! Sounds kinda strange but I like it, I may just have to go to my local farmers market this weekend and pick me up some blueberries so I cantry this thingy out. i just made this last night….. except…. with ….. strawberries. yes. well, it wan’t like barbeque sauce in the traditional sense, but it was very interesting, none the less. i put it on some french fries last night, i plan an pureeing it (it was kinda chunky) sometime soon, and putting it on chickpea cutlets. so, success in my book, thanks, isa!!!! update- i just made chickpea ‘ribs’ smothered in this. mmmmmm. i can’t say they taste like ribs, because i’ve never had ribs, but they certainly were delicious! Cool! You are the only one who made it so you have to compensate by making it twice. Oh cool! My best friend’s parents grow blueberries, so next time they give me some, I’m making this. Thank you for the recipe! I made it. It was good. I made this today and it was great! This would also be good as a chutney, with the sweet and the spicy. Can you please elaborate upon what you do with tempeh? Thanks! Thanks for the great idea. I have had bunch of wild blueberries sitting in my refrigerator. I’m going to make a nice tomatillo, black bean flatbread smothered in this BBQ. Mmmm. It didn t work for me!